Keep up with all of Laura McKenna’s great cooking tips, recipes, and clever kitchen ideas every Thursday after 7:30am. 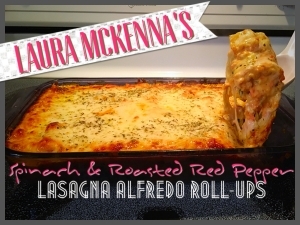 Tons of Laura McKenna’s recipes can be found HERE and all of Laura’s In The Kitchen Tips are below. Despite the current online trend, DON’T USE shaving cream to dye your Easter Eggs! Instead try this non-toxic way to get that watercolor swirl on your eggs…. Did you know that brown eggs hold the colored dye better than their white counterparts for a more vibrant Easter egg. Keep your saran wrap in the fridge! It makes it easier to use and doesn’t tangle and stick to itself as much when you’re trying to cover your dish! You’ll love this recipe and so will your family! Don’t be fooled by the long name or the “roasted red pepper” (it’s not spicy at all, just delicious)! To get the freshest eggs possible, look for the “Julian date” on the carton. It’s a three-digit number near the expiration date that tells you the day of the year when they were packed. “001” would mean January 1st. And “365” would mean December 31st, because they were packed on the 365th day of the year. There should be another string of digits, either above or below the expiration date. And THREE of those numbers are the “Julian date,” which tells you when they were packed. The three digits represent a specific day of the year between 1 and 365. Depending on the brand, the Julian date might be the first three digits, or the last three. There’s also a number with the letter “P” in front of it, but that’s just the ID number of the packaging plant. So ignore that one, and look for the three-digit Julian date instead. It should be right next to it. Once you find it, just look for the carton with the most recent Julian date, and those should be the freshest eggs. Usually that’ll be the highest number (except in January when a really high number means the eggs were packaged in December). Don’t toss the scraps of your lettuce. You can regrow romaine lettuce by placing the core of the lettuce in about an inch of water. New lettuce will grow up from the center. Once the old lettuce falls apart around the base, you can even plant the freshly grown new center in the ground and keep cutting off what you need from the top. Hollow out the stem of the cabbage and place it on a beer can on the grill. Close the lid and every 15 minutes, brush with BBQ sauce until the outside is dark and charred. This should take about 45 minutes or so. When it’s done grilling, slice into wedges for a smoky side dish or cut into strips and eat it like a puled pork sandwich. You have probably heard of tossing your sliced apples in lemon juice to prevent them from turning brown. But if you don’t have lemon juice on hand, lime juice works as well. And so does Sprite! FIRE ANTS ON A LOG! Want a quick, easy, and healthy After School Snack for your kids? 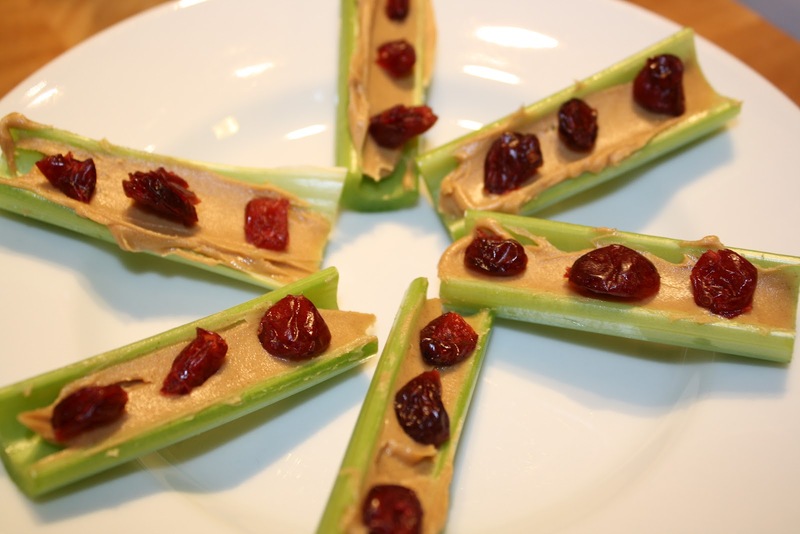 You probably already know how to make “Ants on a Log” (take a piece of celery, smear the inside with peanut butter, and place the raisins on top to look like ants). But want to kick it up a notch and make it a little more exciting for your kids? Replace the raisins with dried cranberries for a little twist on the old favorite! Steve is still battling a nasty stench in his microwave after burning up an Easy Mac nearly a week ago. HERE are a few ways to neutralize horrible odors in your microwave. Do you hate to grocery shop? 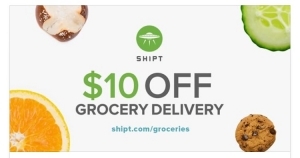 Shipt is now available in Green Bay & Appleton! You place your grocery order online and it’s delivered to your door! This large, ugly “fruit” is grown in tropical regions of Asia and can be sliced open and shredded like this one. Replace the “meat” in your favorite recipe with jackfruit! Cook the jackfruit with your favorite BBQ sauce or taco/fajita seasoning. Then you can make sandwiches or tacos and they taste just like pulled pork. In particular, my favorite is: BBQ jackfruit, coleslaw, and a pretzel bun. Yum!! The hole in a spaghetti scooper untensil is actually a measuring device. If you were to fill the hole with the raw spaghetti strands, that would equate to one full serving. Cutting onions? 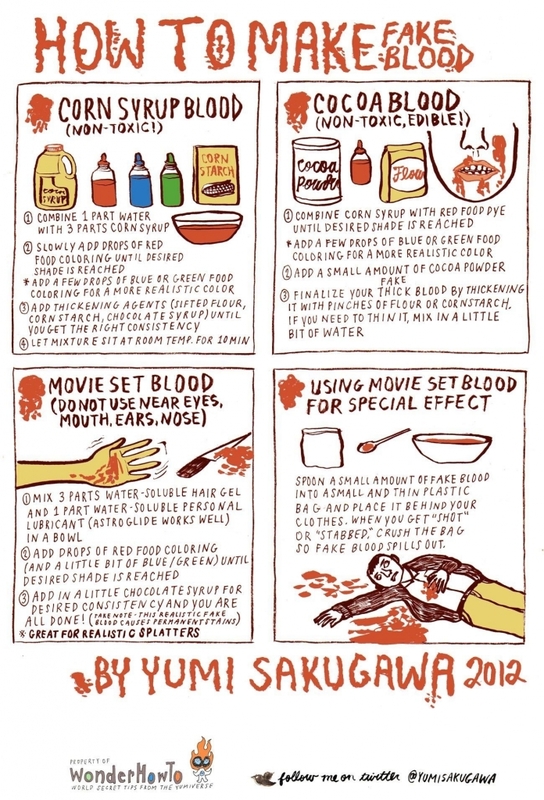 Here’s how to NEVER cry again! Peel off the skin and cut the onion as desired, leaving the root end intact. When cut, the root released sulfuric compounds that make eyes tear up. I absolutely hate to wash dishes, especially those pots and pans with burnt-on food. But put down your scrubber and grab a dryer sheet. Yup, a dryer sheet!! Fill your pan with hot soapy water and throw in a dryer sheet then wait at least an hour and prepare to be amazed! All the grease and grime comes right off with barely any scrubbing. Then you can do a quick wash and you’re done! Put all 3 ingredients into a crock pot and heat until all melted together. Keep the crock pot on low and serve with tortilla chips. **Laura makes hers vegetarian style. So instead of the ground beef, she uses meat-free beef crumbles (Morning Star Meal Starters Grillers Crumbles or Gardein Ultimate Meatless Ground). Those can go right from the freezer into the crock pot. Is your green pepper a male or a female? Work with half of the cookie dough at a time when rolling and cutting cookies. Too much handling of the dough makes cookies tough. Keep the other half refrigerated. Chilled dough is easier to handle. Keep your mashed potatoes hot and creamy no matter when you make them or what time dinner is served. Store them in a crock pot on low and stir once every hour (as needed). Just remember before you add your mashed potatoes into the crock, spray well with non-stick spray or wipe the inside with butter. Herbs, herbs, and leftover herbs! Thanks to Dylan James (from the weekend show on Star 98) for the photo and the tip! If you grew tons of herbs and don’t want to dry them for use through the winter, just put them in a food processor with olive oil. Once it’s all mixed up, put the mixture into ice cube trays and freeze. Then anytime you’re cooking and need basil, pop out a cube and drop it in your pot/pan and you’re good to go! Even if you’re short on space, DON’T store food on top of your fridge. Your refrigerator releases heat and heat rises. The stuff sitting on top of your fridge is subject to warmer temps, so some of it could spoil faster. Bread and baked goods are prime targets, since mold growth loves heat, humidity, and light! To keep your buns fresher longer, store them in a cool, dark place (like the fridge or the bottom of your pantry) in a tightly sealed bag. Wine might get ruined, too. Vino does best when stored between 52 and 58 degrees. Any warmer and it runs the risk of deteriorating faster, developing off flavors and eventually spoiling. If you like your scrambled eggs creamy, add a little heavy cream or half-and-half to your egg mixture before cooking. If you like them fluffier, add a little water instead. Serve up your holiday chilled beverages in a punch bowl. Make a festive floating ice ring (or block) by filling a jello mold or bundt pan with fruit and water and freezing it. Then it will float in the center of your punch and keep whatever you’re serving cold and pretty. Special tip: Boil the water before freezing it and it will appear crystal clear when you freeze it. If you skip the boiling process, your ice may freeze with a cloudy look. Gift wrap all the items in your kid’s lunchbox for a festive surprise in the cafeteria. Want a cute (and simple to make) gift for a co-worker or Secret Santa exchange? Fill a clear mason jar (or any glass container) with all the dry ingredients you would need to make your favorite cookie recipe. Make sure to layer the ingredients so that it looks pretty. Then include the recipe. It’s a great project for your younger children to do for their teacher, too. Don’t have a favorite cookie recipe? Try mine! Always use room temperature eggs when baking. With room temperature eggs, the whites and yolks will combine easier when whisking or mixing. This means that the eggs will blend more evenly into the batter, making for even cooking and a lighter texture (because the eggs trap air). To bring eggs to room temperature quickly, soak them in a bowl of warm water for 10-15 minutes. Always soak raisins for 10 mins in hot water before making baked goods that call for raisins, then pat them dry. That way, they always stay super juicy and delicious in cookies and cakes. Put the batter into ice cube trays and freeze. Pop out the frozen cookie cubes and store in the freezer until you are ready to bake again. Keep bugs out of your drink when you’re soaking up the sunshine by topping the glass with a cupcake wrapper. Turn the cupcake liner upside down onto the glass and poke a straw down through the center to secure it in place. To keep eggs fresher for a longer period of time, rub them with vegetable oil before putting them in the fridge. This will help keep them fresh for an additional three to four weeks. Finish off the Nutella? Stop!! Don’t just rinse the remnants down the drain and toss the empty container into the recycle bin. Instead, heat milk and pour inside the empty jar. Tightly replace the lid and shake, shake, SHAKE!! The hot milk will clean the inside of the container and in the process it creates the most delicious cup of hot chocolate that you’ve ever tasted. If you’re like me and you still brew a full pot of coffee, you probably have a lot left over. Instead of dumping it, pour the leftover coffee into ice cube trays and freeze them. Use the frozen coffee cubes to ice your iced coffee drinks. I also like to use the coffee cubes for after dinner drinks made with Baileys or Kahlua. Either way, you’ll never have your cool coffee drinks watered down again with regular ‘ol ice cubes. Last week we talked about saving leftover coffee to use later in ice cube form. But let’s say you spilled a little when you were filling your ice cube trays and now you have stains on your counter top. How do you remove them without abrasive toxic cleaners? Simple: Mix together baking soda and water until it forms a paste. Rub the paste onto any coffee or tea stains, let it sit for a short time, and then wipe away. Use your hair dryer to melt chocolate! Chop your chocolate into pieces (or use chocolate chips) and put them into a bowl. Turn the hair dryer on high and hold it about 10 inches away from the chocolate. Move it around so that you blast all angles of the chocolate and pretty soon, it’ll be melted into a smooth, dippable consistency. Who needs a double boiler when you are armed with a hair dryer? Keep brown sugar from clumping by keeping a few marshmallows in the bag. Cut a lemon in half and put both pieces in a glass of hot water. Place it in the microwave and turn it on for about 5 minutes or until the water starts to boil. Then let it sit inside the microwave for 1 minute. Remove it from the microwave and all the gunky stuff will wipe away with just one swipe. Here’s a “grate” idea for you as you prepare all your dips and dishes for the big game. To prevent cheese from sticking to the cheese grater, place the grater in the freezer prior to using it. It’s like magic. The cheese won’t stick. Please your entire crowd during breakfast with this individual omelet idea. Allow all your breakfast guests to add their choice of ingredients into each muffin compartment, add egg mixture (scrambled eggs or liquid egg substitute), and bake. Everyone gets exactly what they want and each personal omelet is ready at the same time. And CLICK HERE for my White Chocolate Pumpkin Cookie recipe. You’ll never buy expensive foaming hand soap again! All you need is Dawn dish soap and you can create your own homemade foaming soap. *Fill an empty foaming hand soap bottle 1/4 full of Dawn dish soap. *Then fill the rest of the bottle with water, replace and tighten the pump lid, and shake. That’s it! Foaming soap made cheaply with Dawn! After you prepare corn this way, you’ll never boil it again! It’s less mess, less work, great taste, and super easy. into your oven for 30 mins. at 350 degrees. No need to soak the corn before baking. The corn will be steamed from within and cooked to perfection. use a sharp knife to chop off the stem end. Hold the corn by the other end, gripping the husk and silk. The secret ingredient to light and fluffy pancakes: CLUB SODA! Substitute club soda for the liquid (water or milk) in your favorite pancake recipe and your pancakes will taste as good as they do in a restaurant. Turn a green banana yellow with the help of a paper bag. When fruit (a banana, a peach, etc.) is put into a paper bag it ripens faster. Keep bananas from turning brown by wrapping the end of the bunch with plastic wrap. Even better, separate each banana and then wrap the end. The plastic wrap blocks gases from releasing out of the stem, which makes the fruit ripen faster. Ice cubes can water down your drinks. But you don’t want warm cocktails, right? Freeze grapes and use them as ice cubes in wine, cocktails, or drinks for your kids. They make a great snack after the drink is gone, too.